Photo reproduced with the permission of the Keeper of Public Records, Public Record Office Victoria, Australia. 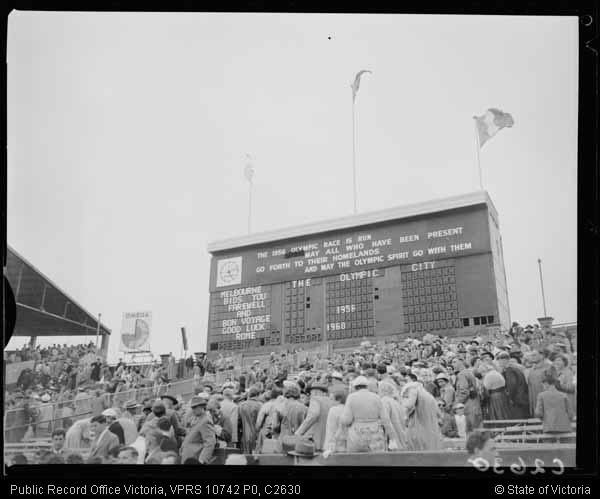 You’ll also find a history of the MCG scoreboard right here at Scoreboard Pressure. Yes, John, it does look like the MCG scoreboard went digital and/or electronic for the Olympics, doesn’t it? But then, seemingly, reverted to the old ways afterwards. Maybe it was all too futuristic for staid old Melbourne. Indeed it did go digital! Check the link Brass Band and Scoreboard and you can clearly see the globes. Its the MGC’s own version of the Nylex clock! Great work there footy maths!!! How strange!